Mongolian nomads are pastoralists who live in near autarky, the life of the family depends on the health of herds and is punctuated by caring for animals. Cold muzzles: cows / yaks, camels and goats. Several times during the year, according to the needs of livestock and pasture conditions, nomadic families move their yurts. The locations are carefully chosen, and are generally the same from one year to another. In summer, the nomadic family will favor a location near a river, to ensure water supply for the family and herds, and good pastures. 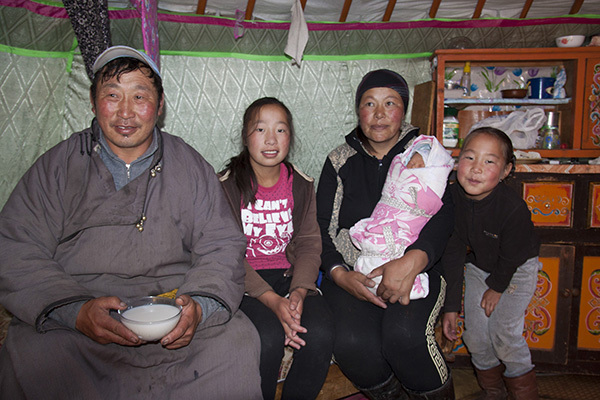 In winter, the priority is given to protection against the intense cold of Mongolian winter, and the family settles its "winter" camp sheltered from the wind in a small valley or at the edge of a forest. Small enclosures are often built to gather the herds at night so they keep warm. The horses (and camel in the Gobi Desert) play a special role, because they are used for transport. The woman is very busy with the household, kitchen, 2 or 3 children, and milking the mares, cows... at least five times a day. The processing of dairy products (cream, yogurt, liquor, milk, cheese ...) takes a long time as well. The husband watches the herds of yaks, horses, cows and sheep scattered on often significantsurfaces and must gather them every night to protect them against the wolf attacks, frequent in Mongolia. He also deals with equipment maintenance and repairs.